This is about the simplest of all spatial transformations. 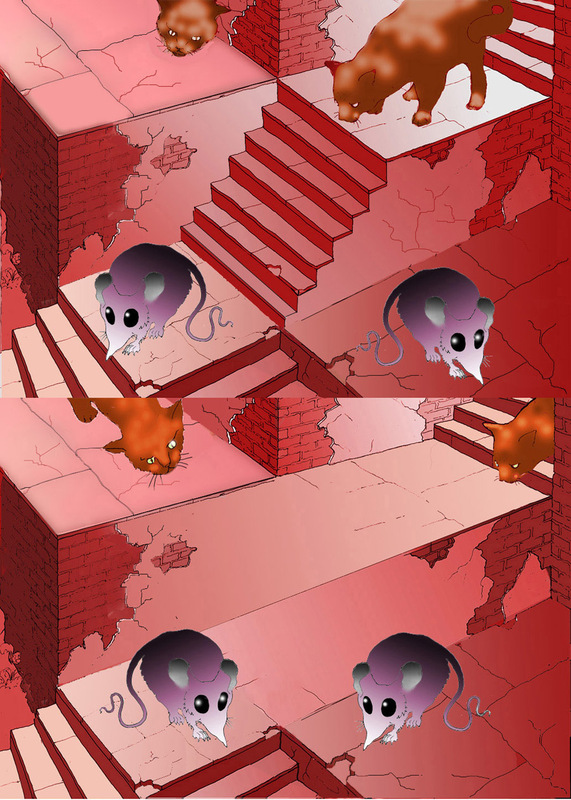 In the top picture, the mice are at risk from the cats. In the bottom picture, the stairs have vanished, and as the eye travels along the picture from the left, a concave terrace turns into a convex, step shape. There’s now a protective inside/out space-warp between the cats and the mice. I adapted the scene from one I devised for my optical illusion cartoon story. If you wanted to experiment with scenes based on this transformation, the essential scheme is as to the left here. Note that there must be no tonal contrast across the middle line, just in the middle of the image. Topologically, I suppose the shape is just a saddle shape, as to the right, so it could exist as a rectangular, 3 dimensional shape, but it would be such an improbable one, and seen from such an unlikely angle, that it looks like an illusion. For a fiendishly clever picture on the theme of inside out transformations, see M.C.Escher’s print Convex/Concave. (Try that title in Google images, or find it on the official Escher website).